This will be my only blog post of 2013 (sorry for discontinuing last season). 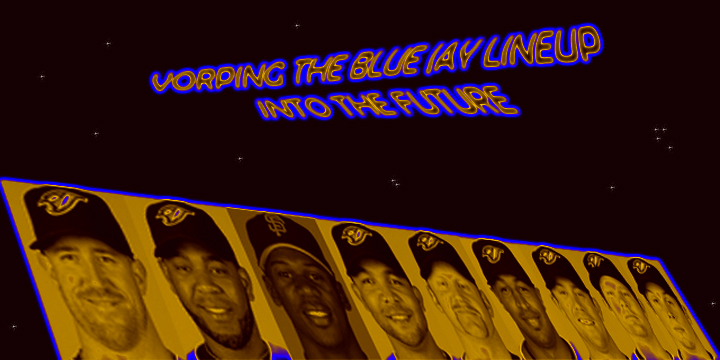 This piece of PhotoArt is my representation of the hope I have for this team going into 2013. So much is riding on this season for the Blue Jays. Fans have been longing for playoff baseball in Toronto for a long, long time now. The team the Jays have assembled has be well documented, but to reitterate (notably we got Reyes, Dickey, Buehrle, Melky, Bonifacio, Josh Johnson!!!!!!!!). I will burn this image (a Photoshop burnt image technique) if the Jays season falls off the ‘playoff map,’ so to speak. Hopefully, that does not happen and I can add a playoff pennet to the image – or dare I say – a World Series trophy or ring!!! So, in a way, the Jays season is contained metaphorically in this image. 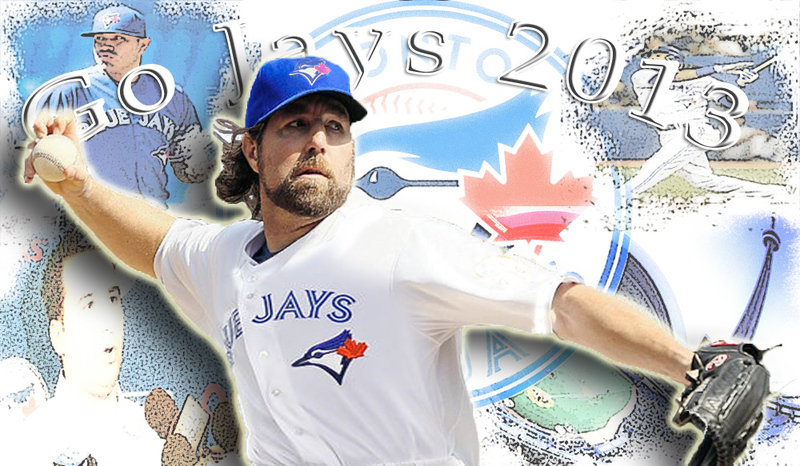 Go Jays 2013! Enjoy the season Southern Ontario! Metaphorical representation of the Jays in 2013. Image will burn with failure and obtain a pennet/ring with success. Toronto Blue Jays right-fielder/third baseman, Jose Bautista, signed a multi-year contract extention with the Blue Jays for 65 million guarenteed over five years. The club will also have a 14 million dollar option for a sixth year if they choose. Bautista had a breakout year last season leading MLB in homeruns and becoming one of the most feared hitters in the game. He showed outstanding improvements in pitch recognition and bat speed, in my opinion. He’d always shown a good ability to turn on a fastball, now he is great in that respect. Currently, there are no indications that another 50 homerun season for Bautista is out of the question, but that is a debateable point. I, for one, am very impressed with his approach at the plate, however, I do realize that 54 homeruns is difficult thing to replicate in MLB. I can see how offering this contract to Bautista was an especially tough decision. Its hard to evaluate a player after only one year. Regardless, the Jays locked him up and now it is time for celebration. I cracked a Brahma for Bautista, which is a great Brazilian beer, but I’ve been told that the beer of choice in the Dominican is called Presidente. Anyway, Cheers! Salute! More ballgames beers and Bautista bombs are in my future. Me happy. 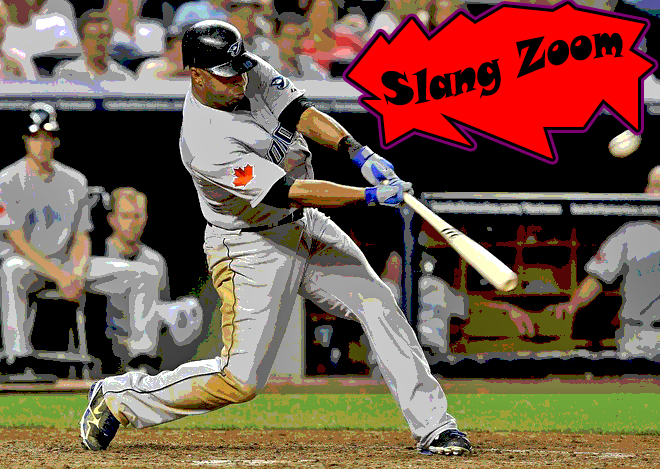 No could have predicted the year that Jose Bautista had in 2010. He became Major League Baseball’s most dangerous homerun threat, and has characterized the Blue Jays as an excessive homerun hitting team. As I watch Roy Halladay do what I always knew he was capable of doing, I’m reminded of the old identity the Jays had with ‘Doc’ as the star. In 2010, Jose Bautista changed all of that. The Blue Jays, and more specifically the Rogers Centre, is now a scary place to play. Opposing pitchers are coming to another country, and they are being harrassed and assaulted by a lineup with deadly weapons. Entire pitching staffs are being held hostage by Blue Jay bats. The structure of the game is crumbling as we wreak devastation on MLB. 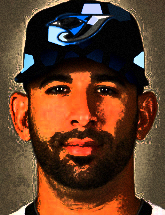 Bautista is leading his rebellion army across baseball and (hopefully?!? arbitration?) into 2011. Na, Na, Na, Na, Na, Na … BLUE JAYS!!! The story of the 2010 season has been that the Blue Jays lead the majors in team homeruns with 179. Second place is not even close at 155. Despite the ‘homerun happy’ numbers, the team sits 9 games out of a playoff spot. I’m tuning in same ‘bat’ time (sometimes varies), same ‘bat’ channel (usually on Roger Sportsnet) to see if we can make up that 9 games from here on out. today are VORP, and a UZR/150 score. he had on the Yankees 2009 A.L. East pennet team last season. position in order to assess VORP. value is made to characterize any ordinary player that can fill the role. where the offensive output at the replacement level is the highest. after a guy with some proven production. Encarnacion played his best year at the Great American Smallpark in Cincinnati. establishing 3rd base help now, they are not doing their job. Gonzalez another 2 years if he keeps playing like this? might get another one-year contract with the team? and could be an emerging star that we could get very good value out of. Snider is well above the curve. season Jose Bautista mainly played a utility role with the Jays. This season he has moved around positions on a more permanant basis. and Fred Lewis to a utility role. ways to help a very young, inexperienced, but inexpensive pitching staff. many guys have been stepping it up this year? VORPin it up, and slugging with the ‘big boys’ in the A.L. East. Keys to the Season: What they are saying? What I am saying? The Blue Jays enter 2010 depleted of some depth. We traded our only front-end starter (Roy Halladay), let our best defense outfielder walk away (Alex Rios) and also traded our best defensive infielder (Scott Rolen). finish, once again, 4th place in the highly competitive A.L. East. League. Hello Kansas City Royals! I’m not about to go nearly that far, but I do believe the Jays 2010 success is contingent on some key factors. to supplant my own personal lack of baseball intelligence. pin-pointing the downfall of J.P. Ricciardi in previous years. doesn’t seem headed that wa -, but it might be an idea? effect. They are both a key component to our team now. They now have to show that the team can rely on them. serious. These guys all have to produce for the Jays to compete with the potent lineups of New York, Boston, Tampa and now Baltimore. some Yankees writers compared Romero’s stuff, notably his changeup, to Mets ace Johan Santana. pitching staff, but he is still learning. starter is good sign that he will be one ‘key’ to watch in 2010! As for the rest of our staff, the Jays look to be going with three of Brian Tallet, Marc Rzyepcynski, Brandon Morrow or Dana Eveland. Eveland had a very strong spring that propelled him into the mix. It is hard to tell how he will fair with the Jays, but he has certainly opened some eyes this spring. He might be the most unlikely candidate to lead the staff, but these kind of players sometimes emerge. Look at Ben Zobrist last year? due for a breakout year capitalizing on his chance to start full-time. If Anthopolous hit a homerun with this trade, 2010 could be very promising! the same way. Zippy (as I call him) is very advanced for his age. He has four good pitches that he can command, but they don’t overwhelm batters. Both these guys are solid optionsm, but without a very high-ceiling. brings a great arm and a somewhat deceptive left-handed delivery. their excitement on him. I know better than the rely on a rookie though. on rookies emerging in dramatic fashion. 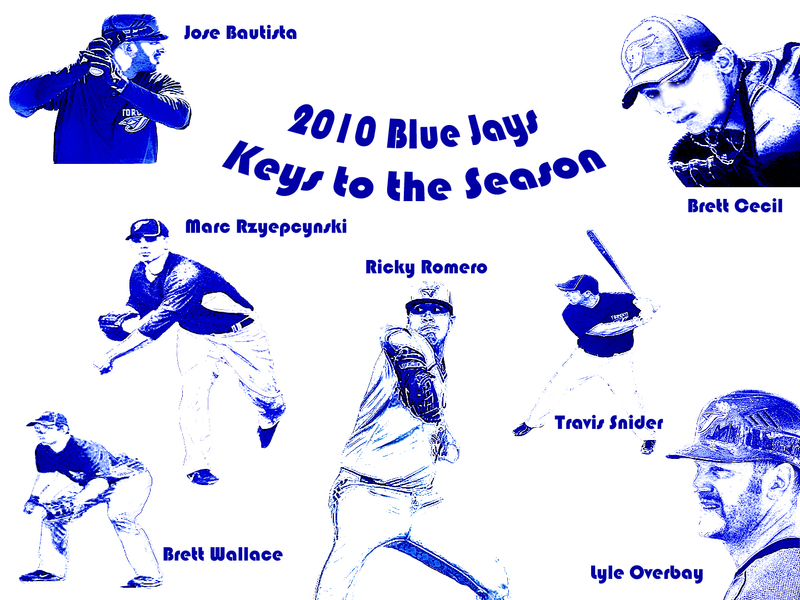 contributions of Drabek and Cecil as possible ‘keys to the season’ … and the future for that matter! catcher acquiring John Buck to replace Rod Barajas and got a little weaker in the outfield losing Alex Rios. The Jays outfield will now have Jose Bautista. outfield spot, it could get ugly. Also Edwin Encarncion at third base is a very risky option. The Jays will need to play good ‘team defense,’ as they look to be deteriorating in that respect. the A.L. East. Notice how I used the word ‘cellar.’ Cellar are often opened by keys … ha ha. Yep, I’m a cornball. When Something is Broke … Put a Little Fixer on it. If only all the Blue Jays decisions could work out like a Pearl Jam song? I guess that we would still be ‘Alive’ in the playoffs, and this ‘Jeremy‘ would be writing a lot more on this blog today. The Blue Jay’s fix, for the forseeable future, is 32-year-old former Montreal Expo scout and Blue Jay assistant GM Alex Anthopoulos. 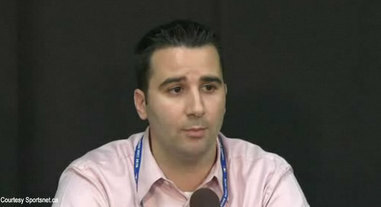 Along with his scouting experience, Anthopoulos has an economics degree from McMaster University. Coincidentally, I also went to this school. Too bad I couldn’t catch his fall after doing a ‘keg stand,’ or something like that? It would have been a good networking opporitunity for me. Anyway, Anthopoulos’ first priority came this week as he did a large revamping of the Jays scouting department. He also told the media that the Jays would committing more money to scouting and player development. Along with bringing in some new scouts, Anthopoulos hired an assistant named Dana Brown. The 42-year-old Brown left his position as scouting director for the Washington Nationals to take up the job with his old friend whom he worked with in the Expo scouting deparment. It does seem a little trendy in baseball right now to hire a young GM. Anthopoulos is already being dubbed, ‘boy genius,’ but he is yet to prove anything. I do like the stance and measures that Alex is taking by committing himself to scouting and player development, but then again, every team committs themselves to that. Here is an old one, “the proof is in the pudding.’ Anthopoulos will inevitably be judged by the choices that he makes as GM. Working close with J.P. all these years, he must have learned a lot. J.P. did a lot of good things with the club, but he also made a large share of mistakes. I wouldn’t say that Anthopoulos has to totally rebuild the club, but he has a lot of holes to fill. Marco Scutaro‘s career might be in jeopardy, let alone his ability to play a demanding position like shortstop. Scutaro is a free agent, so the Jays will definately have to look into what they are going to do with him. Jays catcher Rod Barajas is also a free agent. He did do some nice things, hitting homers and producing RBI’s this season. However, his .258 On Base Percentage is not exactly pleasing to Jay fans, or anyone for that matter. Barajas is definately NOT a long-term solution and it doesn’t see like some of our young catching prospects (i.e. J.P. Arrencibia) are making the necessary progression in the minors. Barajas was a temporary solution last season! Will he be that again? The Jays pitching staff was in shambles last season. Injury plus guys being penciled then quickly erased due to performance, the Jays seeming had what looked like a 10-man rotation last year. We did have some young players progress into major leaguers, like Brett Cecil, Marc Rzepcynski and Ricky Romero but it also became apparent that the rotation could use some much needed depth. The possible return of Shaun Marcum may help Alex a little in that respect. DH and first base are somewhat interchangeable in the American league some might argue. The Blue Jays are not getting the production they need from these two positions. They are usually filled with middle-of-the-lineup guys, but this is not true in the Blue Jays case. Kevin Millar did not have a comeback with the club, and Randy Ruiz, although incredibly impressive, might be too much of a risk to rely on for that position. Using Adam Lind as the primary DH will vacate another hole in the outfield, where the Jays desparately need athletes to run down balls. 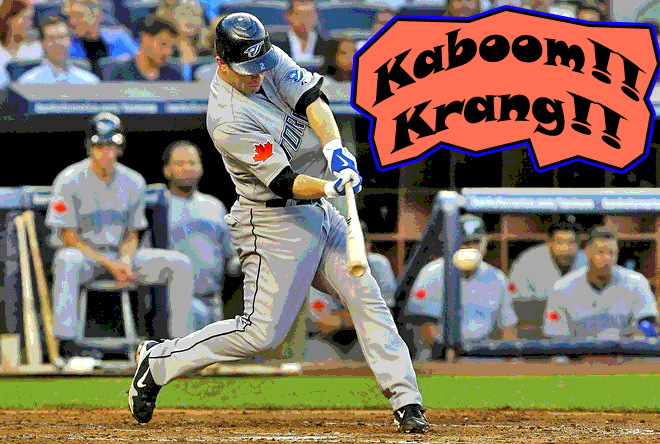 Lyle Overbay is nice player, he gives you a good On Base … yes. However, his trademark doubles have decreased and you’d be hardpressed to go around the league to find a firstbaseman that is just ‘a good On Base’ guy. We need a legitimate slugger at first! I say move Lind to firstbase, get some athletes in the outfield and use Ruiz temporarily at DH till we can find a better hitter. Are we going to live with Edwin Encarnacion at third base? He showed some good things last year, but he does not look like a longterm solution. When are we going to start benching Vernon Wells? The 20 million-a-year man would have a hard time hitting in the bottom of the order for any team in MLB. Sorry Vernon, but the Jays actually got more out of Jose Bautista last year in half the at-bats you had. We don’t have a closer? We just don’t. Jason Frasor has proven ineffective in that role before? Can we live with him there? I don’t envy your job Alex Anthopoulos. Wait, actually I do. If someone told me that I could possibly be the future GM of the Jays with a McMaster degree, I’d go crazy for it. I consider myself knowledgable in player evaluation. All I do is order and read ‘Baseball Prospectus‘ and ‘Baseball America‘ every year. For the team right now, I say be bold, and think ‘out of the box.’ Our scouting system should have a wide range internationally. As the Jays have not made the splash into Japan yet. I say we go after one of the big two: either pitcher Yu Darvish, or outfielder Norichika Aoki. 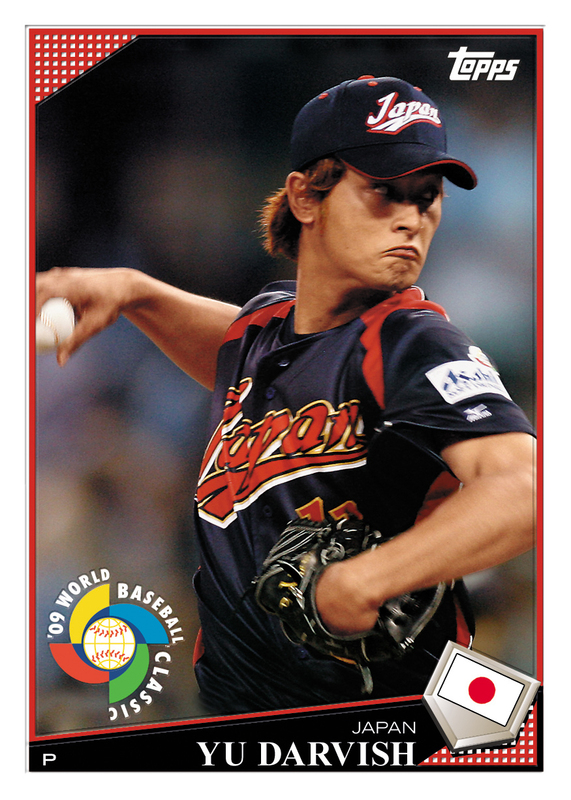 The amount of money the Jays would have to put into acquiring one of these guys would be catatrophic (especially Mr. GQ Japan Yu Darvish), but I wonder if that money could made back in endorsements, merchandise etc… marketing ourselves internationally? 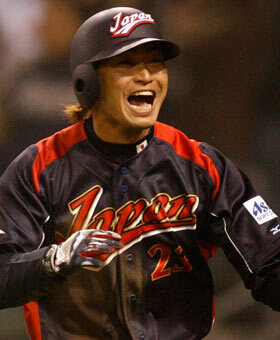 We all saw the Asian explosion in the World Baseball Classic, the Jays need to be bold and explore this a bit.